As you know long time club member, John Johnson, was tragically killed whilst out on a ride on Saturday 12th September, 2009. John joined the club around 1974 as a 16 year old and soon became one of ‘the group’. 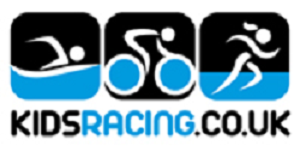 He very rarely missing a club run and competed in most types of events: time trialling, road racing, and cyclo cross. His name appears on a number of club trophies and his main claim to fame was winning the TCA hill climb at Kildale in 1977. He was also elected to the club committee for a short time in the late 70’s. Descending the side of Clay, missing a corner and disappearing down into the woods. The rest of the club run laughing at his misfortune. He was also a member of the quartet who used to always sing (very badly) at the top of our voices as we rode along. The other members being Andrew Allen, Steve Maidens and myself. John loved his music, The Moody Blues being his favourite band after he was introduced to them by my brother, Mike. John met his wife in 1980 and they got married in 1981 a day I again remember very vividly as I was his best man, a job which I was very proud to undertake. John leaves behind his wife, Angela, and sons and daughter, Andrew, Philippa and David. 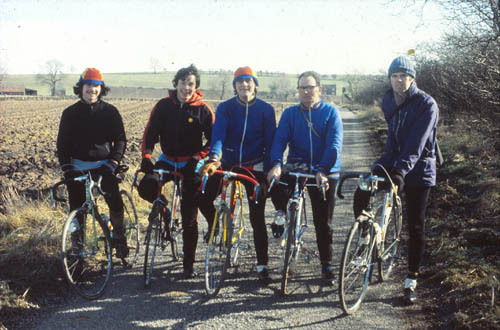 Happier days – left to right Steve Maidens, Steve Binks, John Johnson, Ray Burnett and Geoff Reynolds. Sadly, Steve Binks is now the only one still with us. Steve Maidens died around 1988, Ray Burnett in 2006 and Geoff Reynolds in 2008. Posted on October 7, 2009, in Article. Bookmark the permalink. Comments Off on John Johnson – a remembrance.